New Rochelle, NY, September 24, 2018–A Special Focus Issue on Integrative Oncology takes a wide-ranging view of the possible approaches and potential therapeutic benefits of complementary and integrative medicine in multiple age groups, nations, and special populations. 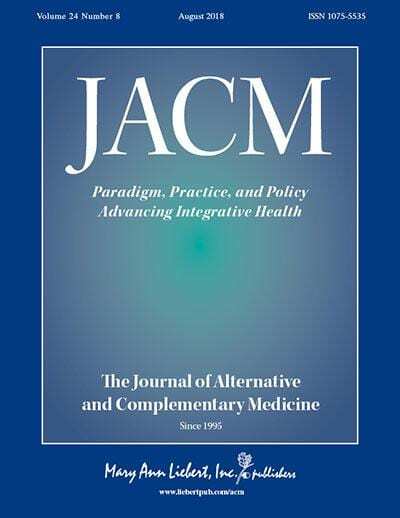 The Special Focus Issue is published in JACM, The Journal of Alternative and Complementary Medicine, a peer-reviewed publication from Mary Ann Liebert, Inc., publishers, dedicated to paradigm, practice, and policy advancing integrative health. Click here to read the full-text articles free on the JACM website through October 24, 2018. In his commentary intriguingly titled "Exceptional Responders, Outliers, and Radical Remissions," cancer survivor Glenn Sabin, of FON Therapeutics, Silver Spring, MD, and author of n of 1, an account of his personal journey, focuses on cancer patients who spontaneously go into remission–also called outliers or exceptional responders. Should these patients be studied or ignored? Dr. Sabin argues that they should be studied and explains why and how, targeting the patient-physician relationship and the potential role of a supportive environment.